Part two in my gratuitous “advice” series, in which I discuss what it’s like to “start over” in a new city as a young adult, and evaluate different ways to approach the transition! I hope you’ll share your thoughts, too, especially since many of you are more knowledgeable than I! I am a young twenty-something (are we tired of this term? Not yet? Okay, then.) who graduated from college last year, and I am in the midst of a few post-graduation changes. One of the biggest anxiety-inducing adjustment post-college for many grads, including myself, is the challenge of moving to a new city! In my experience, it’s not so much the new city that’s the challenge, but rather the interesting phenomenon of going from having lots of friends, and a familiar social situation, to potentially having none. 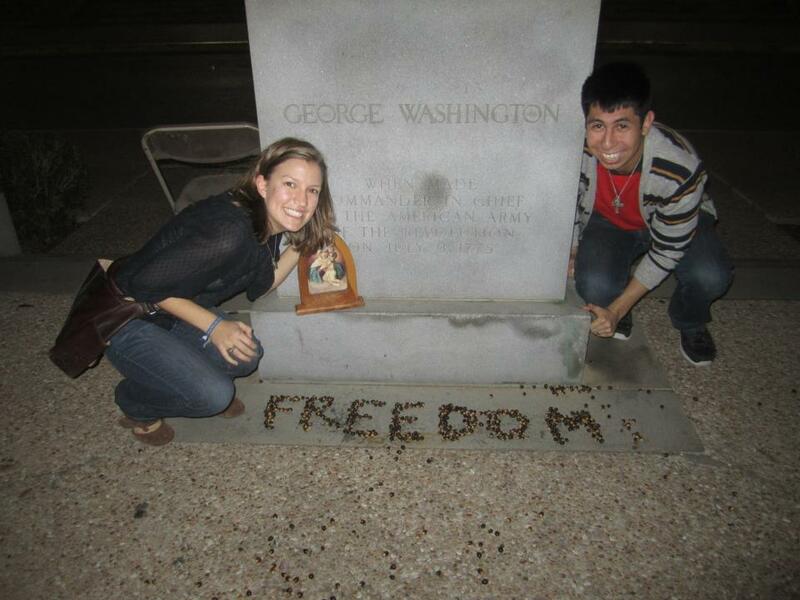 For most people, going to college is the first taste of this kind of complete social upheaval. But I went to school at the “obvious” (yet still competitive and prestigious, mind you) choice, an in-state public university where 30 of my high school classmates also enrolled. I was also lucky enough to live with a high school friend for all four years! So moving away after college is an even bigger adjustment, especially given that many of my best college friends are still living near where we went to school, and I find myself living quite far away and quite on my own. I had a relocation “trial run” when I studied abroad during college, so I was able to learn a few of the hardest lessons of young adulthood while I still had the safety net of my familiar Forty Acres to fall back on. 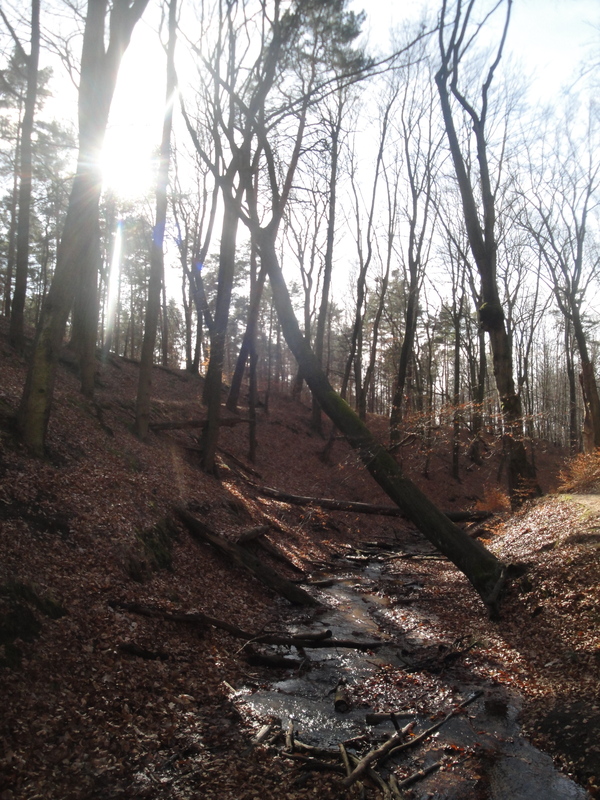 Now that I’ve relocated to Dresden, and am anticipating a move to Madison later this year, I’ve been thinking a lot about what in particular I’ve found challenging, as well as what has been the most rewarding, about striking out on my own in a new place! So without further ado, here is some unsolicited advice from my own trial and error! Challenge 1: Maintaining a sense of self in a new place. It can be tempting to throw “the old you” out the window as soon as you land in a new city. But as far as I’m concerned, dealing with an identity crisis on top of all the changes that are about to happen just sounds like a recipe for disaster. Your life story–your family, personality, preferences, strengths, weaknesses–have a place in your new home, too! For me, it has been really important that I continue to place the same emphasis on my faith as I did at home. Going to Mass every week has been a huge anchor for me… no matter what other crazy changes are going on in my life, the Church is a constant, week in and week out. I can imagine that, if I were a runner or a soccer player, continuing to participate in that aspect of my life in a new place would also be an important stabilizer in a time of instability. 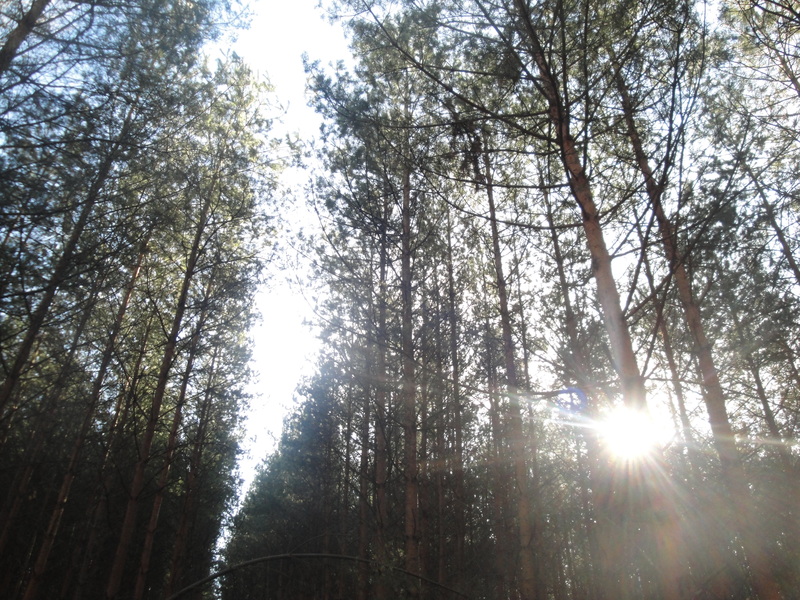 Challenge 2: Structuring your life is harder when your surroundings are unfamiliar. But it might be the most important thing you can do. Without structure, your free time quickly becomes a black hole of watching Netflix and eating chocolate. (That’s a universal phenomenon, right? No?) For me, this problem is multi-faceted. A new location can mess up your day-to-day life simply because you don’t know where things are. For instance, it was not a big deal in college if I was out for the day and hadn’t packed a lunch or cooked anything at home, because I knew all the best places to get a cheap/healthy/on-the-go meal. I don’t necessarily know that yet for any given place in my new city. Even after several months here, I find myself running back and forth and wasting a lot of time because I don’t know the best or most convenient place to eat, make copies, get internet access, etc. The beginning of your time in a new city actually provides a solution to this exact problem, though, because you have a tourist agenda for the first few weeks or months. Make it your job to see all the sights your city has to offer, even if you’re doing some of it alone. It will give you something to do, and at the same time you’ll become more familiar with your new city. Make it your assignment to learn as much as you can about the neighborhoods where you spend most of your time. Find out whether the café near the university has free wifi, and scope out the scene: would it be weird if you camped out there with your laptop for a few hours to get some work done? 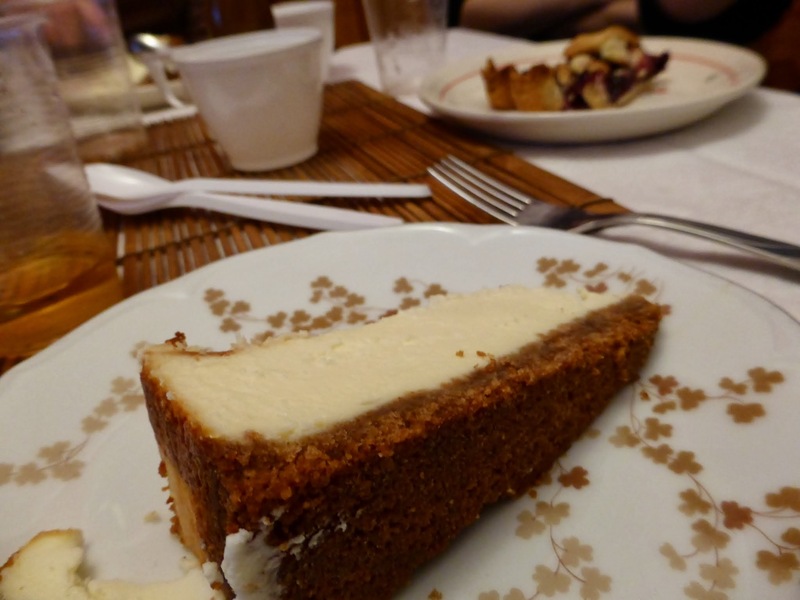 Try out the take-out restaurants… are they worth a repeat visit? Challenge 3: It takes a long time to build a support group of friends. This is really the hardest part, in my experience. I have had the added burden of a language/cultural barrier both times I’ve “moved away,” but based on the experiences of friends within the U.S., making friends is the hardest part of post-college life in general, especially after moving somewhere new. 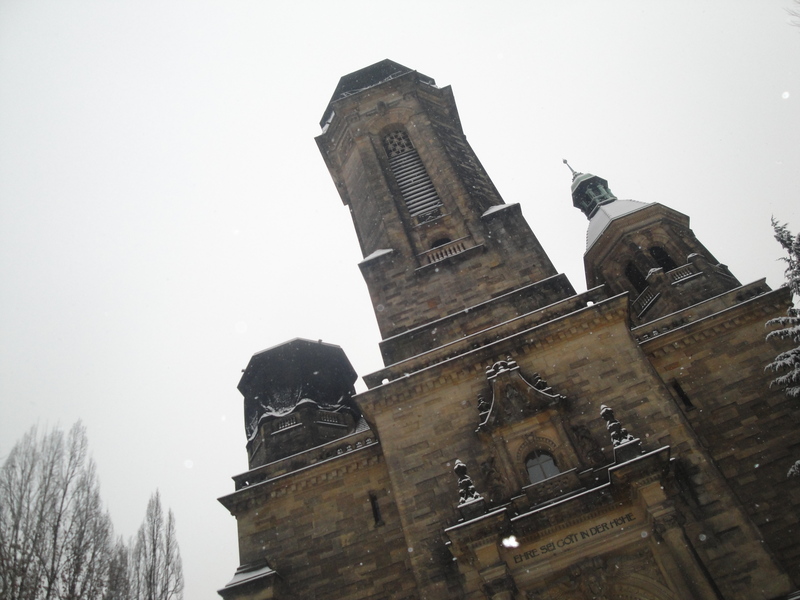 I learned from my mistake in Freiburg and decided not to live alone in Dresden, which has been a huge blessing. But even with a fantastic roommate whose friends have also kind of adopted me, it has been difficult to establish friendships. I’m not a full-time student with a cohort of classmates, and it’s hard to break into pre-established social circles. Not everyone is always going to be as invested as you are in making friends, and it’s rough sometimes when you’re open to being buddies with someone and they clearly aren’t interested (no matter what language you happen to be speaking). In my understanding, there are two groups of people you want to be looking for: like-minded people, and people in a similar situation to you. Like-minded people will have similar interests to you, and as I mentioned in Challenge 1, you have to know what your interests are before you can find them! I’ve had success finding like-minded people at church groups, and have also heard that sports classes are great for this (I’m finally taking my own advice next semester and taking a sports class!). Establishing that you and your new acquaintances have something in common is not only a gateway to meeting them in the first place, but also provides conversation topics and possible activities to do together once you become friends! Finding people who have a similar situation to you, whatever that may mean, is important because you will have a mutual understanding right away. For instance, find an alumni association from your University, or a bar that shows your hometown’s football team’s games, or reach out to the other new coworker who recently moved to town. 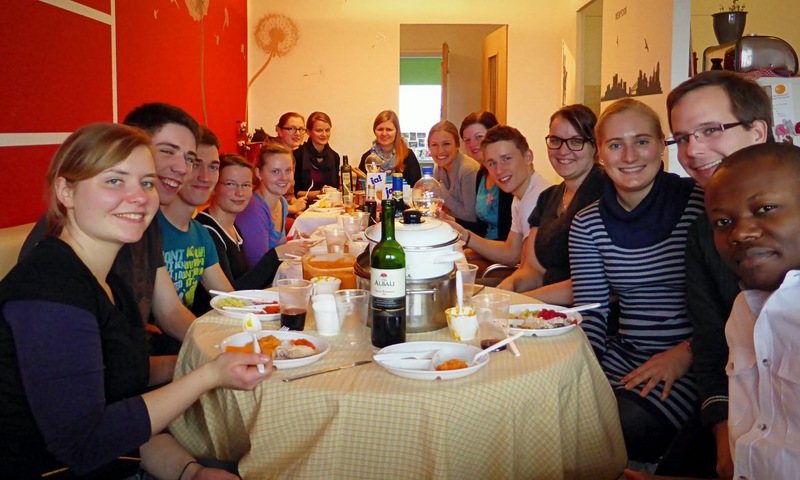 This time around, it’s been much easier for me to befriend other international students and young people living in Dresden: they’re away from home, I’m away from home, we’re all trying to get by with our sorry German skills… instant connection! 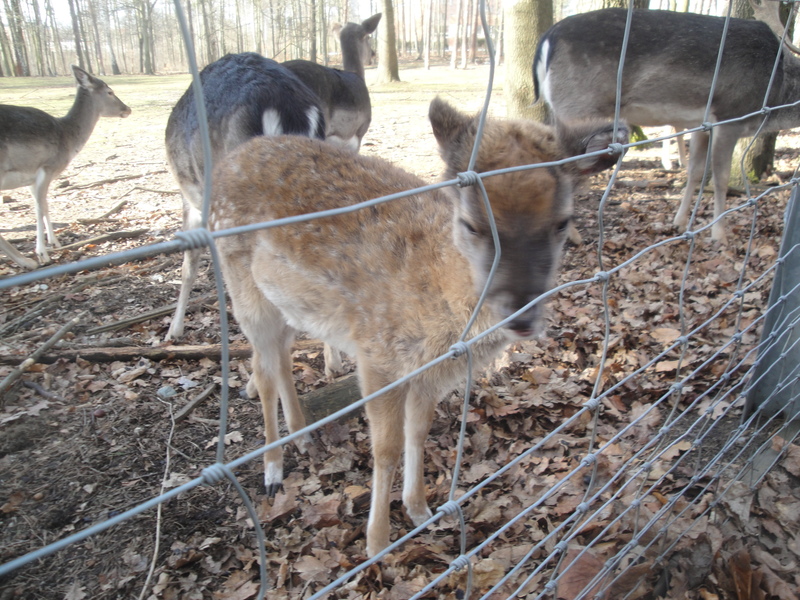 Felicitas and I got close really quickly because we are both dealing with the limbo state of DAAD-scholarship life. I’ve also found that the Germans who are most willing to make the extra effort with new people from abroad are those who have studied abroad themselves. They know what it’s like! One important thing is to be open and to put yourself in situations where you will be able to meet people. This is the hardest thing for an introvert like me (and it’s especially hard when I’m not speaking my native language), but if you are confident enough to brave a new situation, you might be lucky enough to meet kind, generous people who are willing to befriend you! Challenge 4: Incorporating your old life into your new one. I suppose this goes along with #1. Just because you’re living in a new city and/or country doesn’t mean that you leave the rest of your life behind or forget everyone who’s ever been important to you. However, the challenge is that you can’t just live a carbon copy of your “old life” in a new city by constantly talking to your college friends or trying to re-live the glory days. I haven’t fully figured out how to balance the two, and living abroad has its own challenges, but it helps when your friends and family are invested in you, and you are invested in them. I love hearing from my friends and finding out what exciting things the’ve been up to! I am a fan of sporadic Skype dates with my friends, every month or 2, to catch up. I’ve also loved sending postcards when I travel. I would also love to add a pen pal or two. Sending mail doesn’t have the instant gratification of online communication, which also means it isn’t as all-consuming. Taking the time to write a nice letter to a friend or family member, and then waiting for their reply, is a communication mode that is very forgiving of the fact that you are busy living your new life! I haven’t fully figured out how to do this, because it’s a total work in progress. Really, isn’t the integration of relationships, places, and experience the work of an entire lifetime? We have lots of time to practice and hopefully eventually get it right. A few months ago, a friend from college sent me a message on Facebook asking if I would have any advice for a classmate of hers who wanted to study abroad in Germany. As a fairly opinionated person who feels strongly about study abroad experiences, especially in Germany, I was able to come up with a good number of things that I wish I had known before I first came to Germany, as well as things I’ve learned since I’ve been here that I think would be helpful for someone in the planning stages. So I’m making my foray into the scary world of online advice blogging! (I do have a few similar posts in the queue, so keep an eye out for those!) I know no one asked, but that’s why it’s called “unsolicited”! Here is a list of things that you should know if you want to live in Germany. I wrote this list for a student wanting to study abroad, but many items on this list could apply to young adults wanting to get a degree at a German university or work in Germany for a short or long duration, as well! Wait, what’s that? You don’t know German? Well, there’s no better time to start than right now. I know that plenty of people study abroad with no knowledge of the local language, but I really wouldn’t recommend it. Yes, you can get by with English in Germany, but do you really want to just get by during your time abroad? It’s much easier to establish friendships with Germans if you make an effort to learn some German… not to mention being able to orient yourself in your host city and as you travel around. If you learn as much as you can before you leave and keep an open mind during your time there, your language abilities will improve drastically… I know several people who went to Germany with a very limited grasp of the language, and after a year or so of living and working there, were able to converse quite easily! It is possible! 2. Go for a year or longer! 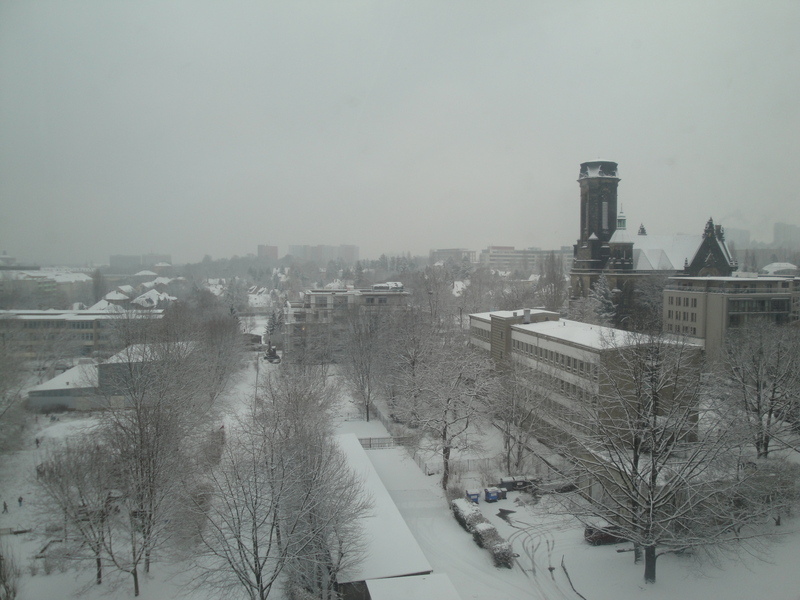 My biggest regret about my semester in Germany during the summer of 2011 was that it was only one semester! I know that a year abroad sounds like a really long time, especially if the norm at your school is to go abroad for 6 weeks, if that (like it was at mine). But a year goes by quicker than you’d expect (especially if you plan to travel), and one semester is barely any time at all to get adjusted to a new country, language, school, city, and culture, not to mention to make friends! If a year would not be possible for whatever reason, go for as long as possible. Plan to arrive as soon as possible before the semester begins, and stay as long as possible after it ends. Many programs offer a language course before the semester begins (which would help with #1! 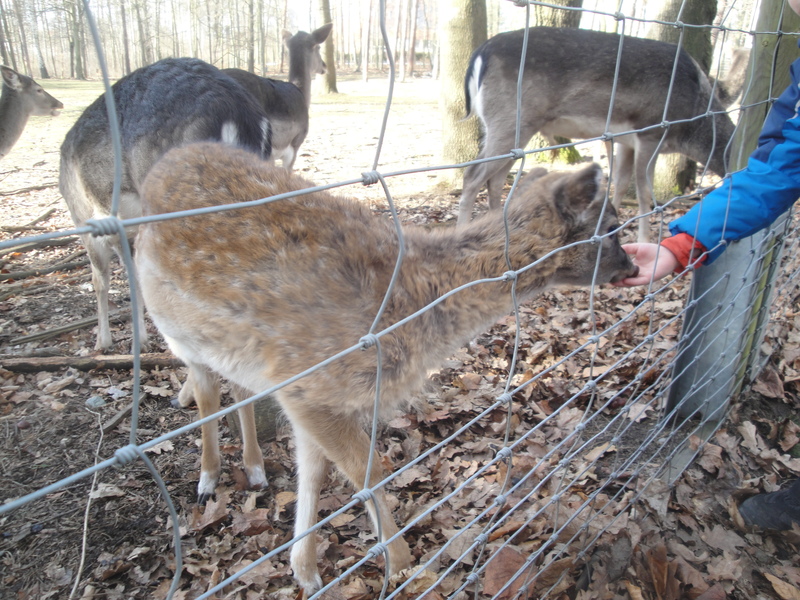 ), which also provides time to get acclimated to the city and maybe meet some people! 3. Location, location, location. Spend some time deciding where exactly in Germany you want to go, because the city you live in will obviously influence your experience greatly. The different cities and regions in Germany are quite distinct. As you consider, pay particular attention to the size of the city in question, and also whether it is in (former) East Germany or West Germany. Even 20+ years after Germany’s reunification, there are still some lingering differences between east and west, particularly where language is concerned. In the west, it is much more likely that any given person on the street or in a shop (especially of the older generation) will be able to speak English. 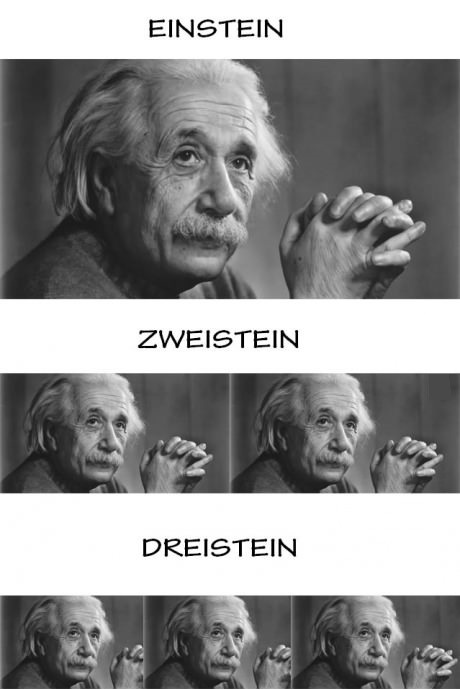 If you aren’t yet fluent in German, that could be helpful. However, if you’re trying to BECOME fluent, the atmosphere in the east might be helpful… people may be less likely to automatically switch to English once they hear your accent! If you will be staying for a year or longer, as I advised you above, choose a larger city as opposed to a small one (or a small city with easy access to a large city). That way, there will be more to explore during your time there. Also, larger cities generally have easy access to smaller outlying towns and attractions and good public transit to get you there. Basically, do your research to find out whether the city you’re interested in has everything you’re looking for. A few odd tips: living near a border gives you easy access to international travel; living in Berlin will give you an exciting and eclectic, though debatably “un-German” experience; it is really hard to find an apartment in most cities with universities, and Munich is notoriously expensive. 4. Go as an exchange student. (Or directly enroll in a graduate program. 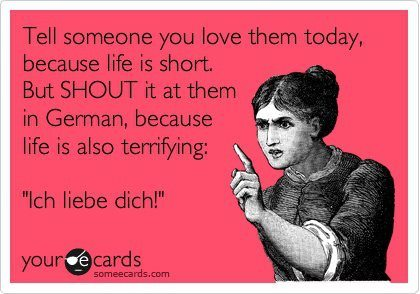 Or get a job working with Germans.) Integrate yourself into society!!! I know for some students studying abroad, a university-affiliate or professor-led program is necessary to both study abroad and graduate on time, but if at all possible, do a direct exchange! It will require some proactivity on your part, because all your classes/travel won’t be planned for you, you won’t have a ready-made community of fellow American students, and you’ll probably have to deal with some university bureaucracy, but you will have a more authentic and rewarding experience (and for pretentious folk like me, that’s what it’s all about 😉 ). 6. Buy a bike. Having a bike gives you flexibility of transportation and allows you to get places quicker so you can do more, plus it’s very scenic and beautiful to ride around during the summer and experience your new city from that vantage point! Hypocrite alert because I don’t have a bike in Dresden (but I might still buy one). This was the most important thing I ever did in Freiburg, though, because I lived far from school and the center of town, and all of my friends had bikes, so if I ever wanted to do something with them, I could just tag along instead of having to meet them somewhere using public transit. Here, the city is big enough that public transit is necessary to get to certain parts of town, and I live within walking distance of most places I go on a daily basis, so I haven’t NEEDED one, but I’m still on the look-out for an affordable used bike, because I love biking! 7. Make German friends. This will help with #1, for sure! It will also help to integrate you into life in Germany. Making friends familiar with your city/region (and fluent in German) is also incredibly helpful as you figure everything out for yourself. It is, in my experience, more difficult to make friends with Germans than to stick in a group with the other Americans/international students (and there is merit to making friends with those people, as well). Two ways I’ve found it helpful to meet people: getting involved at church and taking part in extracurriculars. I’m Catholic, and I’ve been able to meet nice, generous, friendly people at the Katholische Hochschulgemeinde (KHG) in Freiburg and the Katholische Studentengemeinde (KSG) in Dresden. The Protestant groups are called EHG/ESG. And this semester I am finally taking my own advice about the sports/extracurricular activities tactic by taking a dance class! I love dancing and thoroughly enjoyed my classes at UT, so I figured I’d keep it up and meet some people along the way. 9. Don’t compare your experience to anyone else’s. Every person’s time abroad will be unique, so don’t get sucked into the trap of thinking that your experience is “worse” because you can see on Facebook that your high school friend has visited more cities than you have. Make the most of YOUR experience… explore the areas around where you’re living, go to social outings, do something new every week, take pictures. Focus on making your memories, not glancing at someone else’s to compare. Finally, an outlet for my many opinions 😉 If you are itching to study in Germany, or elsewhere in Europe/the world, I hope I’ve encouraged you at least a little bit! 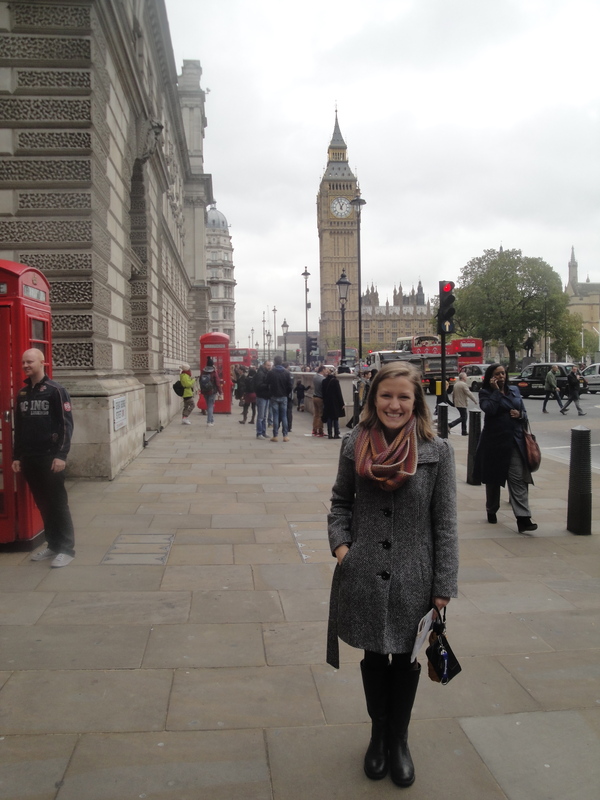 To my fellow study abroad alumni: is there anything I missed?? Anything you disagree with? you know you’re a bad blogger when…. I’m sure I have many “bad blogger” characteristics, as evidenced by the lack of activity going on here lately. But it’s especially bad when WordPress forgets who I am and I have to manually log in…. I’ve now been in Dresden longer than 4.5 months, which is how long I lived in Freiburg, and while I am 100% sure that 10.5 months is a more respectable and less hurried duration to spend abroad, the truth is that the blog-worthy material gets spaced out a lot more! So I’m going to go ahead and stretch the definition of “blog-worthy” and call it even. The semester is now over! The German semester system (at least for the university calendar) is totally off from the American one, which can get confusing sometimes. The Winter Semester, which spans from October to February, just finished up. That means there aren’t any more lectures, but the testing period has only just began… if I’m not mistaken, it continues well into March. Luckily I only had one exam, and we took it last week, so my semester is finished. Classes will start back up in mid-April. Yesterday I visited the Asian markets underneath the train station for the first time!! That sounds incredibly sketchy, and indeed I felt sketchy taking the escalator down below the train station, but the markets were so delightful that I was happy for the rest of the day!!! They have a much more varied produce selection than I normally find at the traditional grocery stores in my neighborhood, I finally was able to get my hands on some crushed red pepper (I know it exists elsewhere but I had had no luck actually finding it), and they even have black beans! I’ll have to go back later on in the year and see if I can’t scrounge up the ingredients for some decent Mexican food. I discovered a few weeks ago that one of the cafés around the corner from campus (or, rather, the part of campus where all my classes are/were) has free WiFi! This is the best discovery ever, because it allows me to use my time incredibly well and also to consume a lot more pastries than I had been previously. This Thursday is the anniversary of the bombing of Dresden during World War II, and apparently the traditional way to remember that occasion is to stage a peaceful protest. I’m told that the Neo-Nazi groups have their own protest, while the rest of the city, in response to both the Neo-Nazi protesters and the general idea of solidarity brought on by the memory of the bombing, gathers to form a human chain. I’m going to participate and have no idea what to expect (other than what I just told you) but it should be interesting! I have quite a few trips planned during the semester break! I’m very excited. I’ll be spending two weeks in Spain, a week in Greece, and a weekend each in Hamburg and Rome over the next 2 months! I know I’ve talked about this at least a few times, but rejoice, blog readers, because that means that at least 4 different times over the next few months, I will be able write legitimate posts about things I’ve done! So look forward to that. I’ve been up to a lot of cool stuff in the past few weeks that I haven’t gotten around to writing about! I’ve gotten to see a bunch of different aspects of what Dresden has to offer, and it has me energized to get out and see even more! If you haven’t caught on yet, I really love Dresden. It is the happiest of accidents that I ended up here! I knew almost nothing about the city before I decided to come here, and the reason I ended up at the university here was correspondence with a professor with whom I’m not even working anymore! 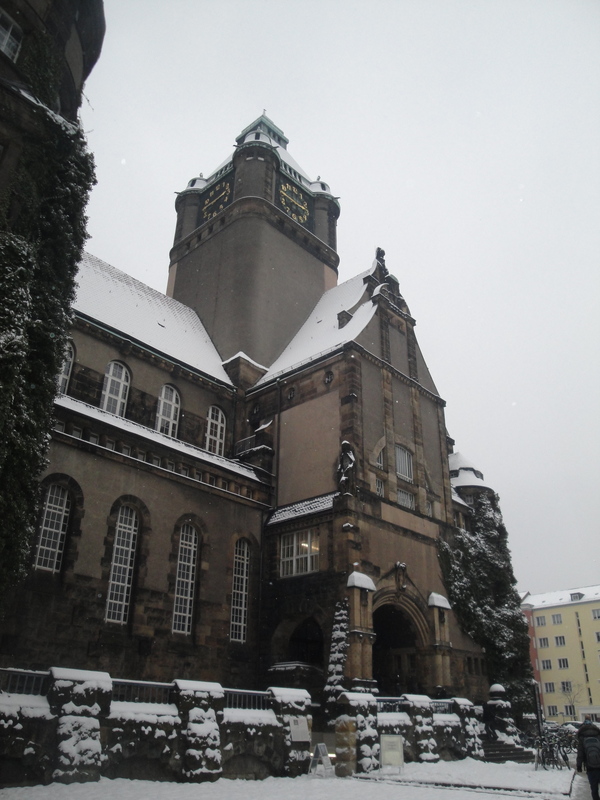 The university, the Technical University of Dresden, is one of 12 distinguished universities in Germany as of 2012 (and the only east German school on that list! ), so even that was a happy surprise, but as far as cities go, I couldn’t be happier! Dresden is big enough that there is lots to do, even after several months of being a (fairly) active tourist-slash-resident. But it’s small enough that it doesn’t take 3 hours to travel from one place to another, a la Houston. It’s old enough to have so much fascinating and inspiring history, yet new enough to have a great art, music, and cultural scene. 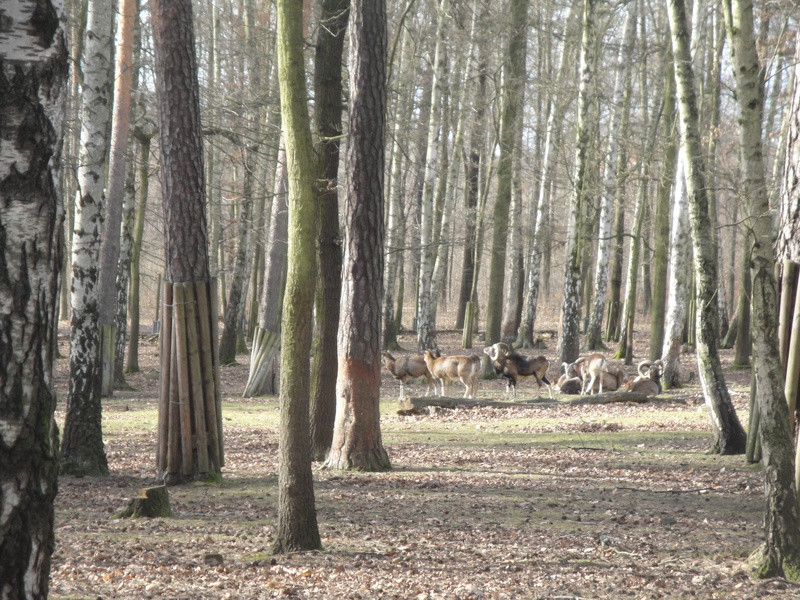 It’s ideally located right between Berlin and Prague (2 hours from each). Basically, I love it here and I’m so glad this is “my” city. 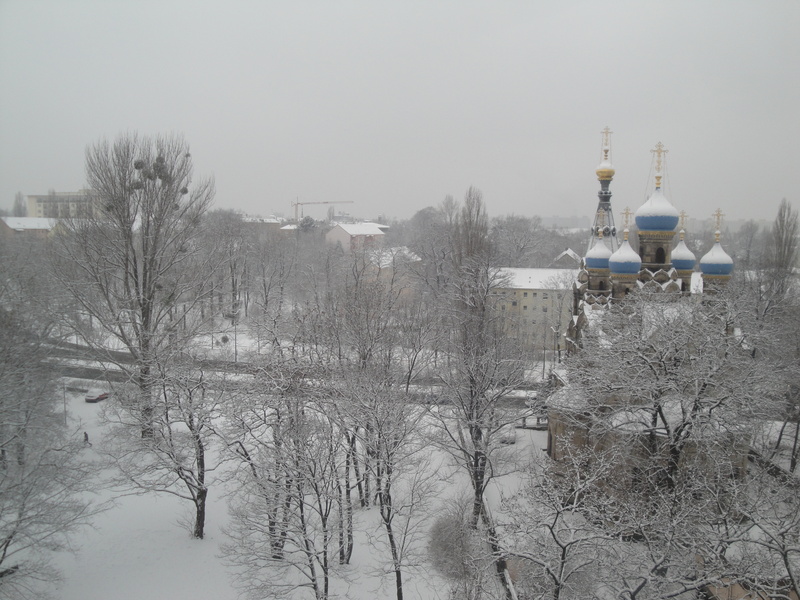 Our balcony view… the Russian Church is so pretty! Two weekends in a row, some of the “internationals” decided to explore Neustadt. Neustadt (“new city,” literally) is the part of town north of the river where most of the bars/party scene is. I had never really been there… I’m not much of a party gal, but it seems to be pretty much my speed, so I’ve been enjoying getting to know it a bit better. One night, Felicitas, Nathaniel, and I got dinner and drinks at one bar where we made fools of ourselves first thing by not knowing how to operate the front door, and then moved on to a magical place called the Schokoladenbar (chocolate bar) where they served wonderful drinks that might as well be dessert! During our wanderings through the Neustadt, we stumbled upon the Kunsthofpassage, where there is a bunch of cool street art and cute little shops. This building supposedly plays music when it rains (though based on this video, that may be an exaggeration… it wasn’t raining when I was there so I can’t confirm)! The next weekend, a few of us went on an outing to the Erich Kästner Museum, also in Neustadt. The name sounded vaguely familiar to me, but it wasn’t until after we got to the museum that I was reminded that Kästner was the beloved German children’s author who wrote Emil und die Detektive, which I think I read in German 2 or 3 in high school! I definitely remember watching the movie at some point. It turns out that Kästner was born and raised in Dresden Neustadt, not far from the museum building! The museum itself was fascinating. 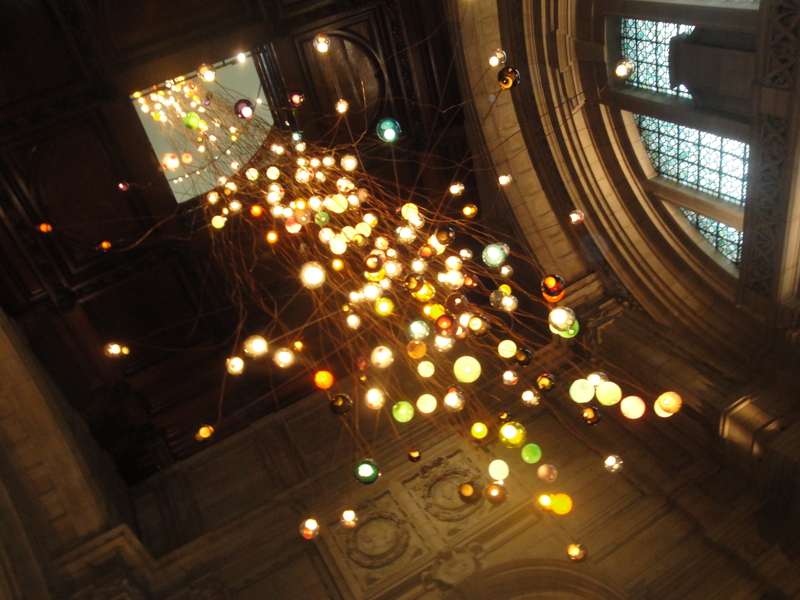 It’s an “interactive micro-museum,” which sounds like a strange or hipster-y concept, but really it was the perfect medium for displaying the life and work of a children’s author. It was all housed within one room, which contained 12 “columns” — basically shelves which each had a bunch of color-coded drawers. The drawers contained various items from Kästner’s life… photos, quotes, documents and letters, books… it was a lot of reading and not much of it was translated, so I wouldn’t recommend this museum to people who can’t read German, but for those who can, this museum was amazing, definitely worth 4 Euros and an hour of your day! One of my favorite artifacts was a letter from Kästner to a children’s theater group in Dresden who were putting on one of his plays and had invited him to their performance. He personally wrote to them to regretfully inform them that he wouldn’t be able to attend, but that he would send his father (the original Emil!) instead! I thought that was so sweet. There were also a few letters of correspondence between Kästner and Astrid Lindgren, who wrote the Pippi Longstocking books (among others). The trees in front of this house looked like lace. While we were in the neighborhood, we also popped into a store called “Beyond the Pond” that imports American and British goods — food, beer, books, etc. I didn’t buy anything, it was all pretty expensive, but it was cool to go check out the American things I could easily access if I ever had an emergency Betty Crocker or ranch dressing craving. As you can see from all these pictures, it snowed basically non-stop yesterday and today. None of that Polar Vortex craziness, just a light little flurry that’s left a blanket of probably 4 or 5 inches all over the place! It’s so pretty! I was such a Texan all day, carrying my camera everywhere to capture the magic before it disappears. I was a little self-conscious about openly taking pictures of things with so many people around… otherwise I would have a lot more. 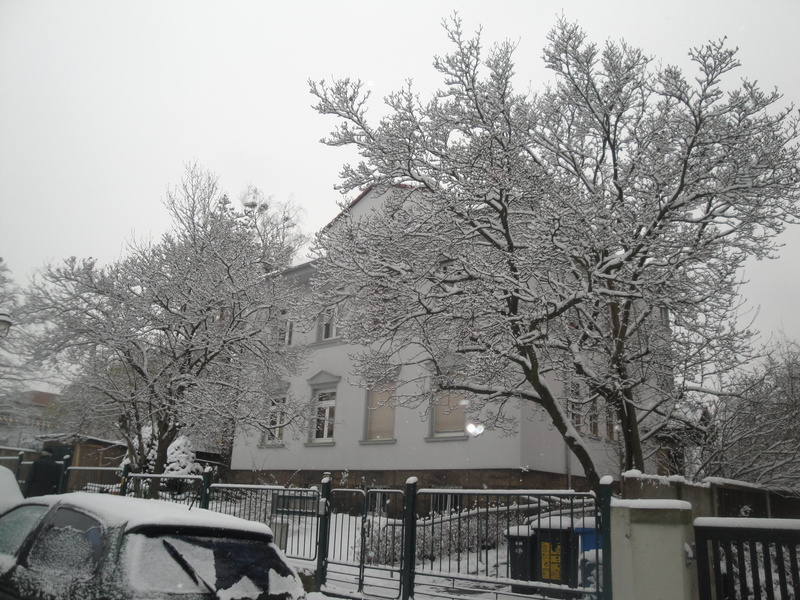 This is the Schumann-Bau where I have 3 of my classes. I think it’s really beautiful. It used to be a prison, which is a little creepy, but also kind of cool. But because everything was looking so pretty and magical, I decided it would be fun to go to the Großer Garten before it all melts (hopefully it won’t for a while, but fresh snow is prettier than week-old snow). The Garten (Garden…yay cognates!) 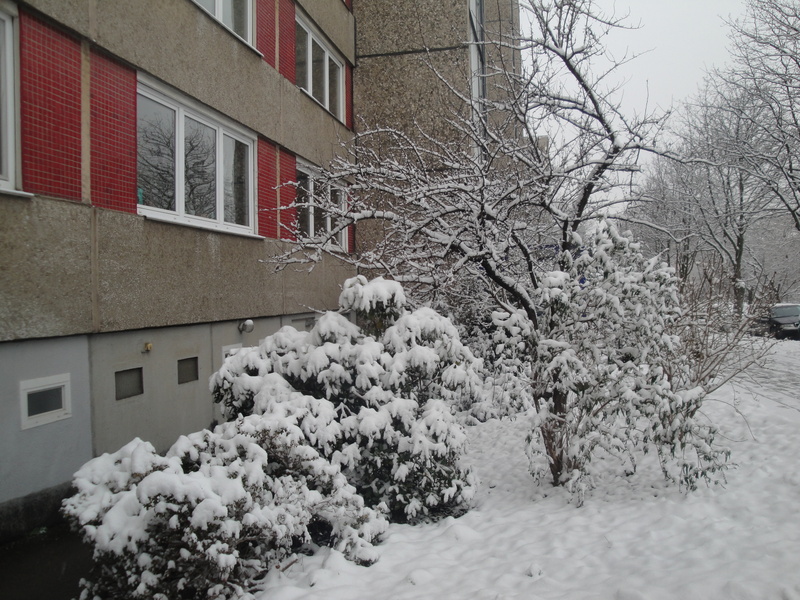 is really big and pretty under normal circumstances, but I thought with the snow it would be gorgeous. Unfortunately it was dark before I got there today, but even though the pictures didn’t turn out, it was so beautiful and peaceful to behold! I’ll have to go one day when it’s actually light outside. This post brought to you by a writing break I’m taking because the winds caused by Winter Storm Xaver are howling uncontrollably, preventing me from focusing on my actual work. In the past, I have claimed proudly that Thanksgiving is my favorite holiday. I don’t necessarily consider it that anymore… I’m not actually sure I have a favorite holiday… but I do have a soft spot in my heart for a day reserved for hanging out with many of my favorite people and eating many of my favorite foods (mashed potatoes are probably my very favorite food and I starkly prefer pie to cake). But alas, Thanksgiving is an American holiday, and I wasn’t sure how I’d get to celebrate it this year, if I did at all. Some of my German friends had expressed an interest in doing something the day of Thanksgiving, and my thoughtful and generous Aunt Mary Beth even wired me a little Thanksgiving fund so I could at least treat myself to dinner somewhere. But due to some terrible judgement on my part, I have a class from 6:30 until 8 on Thursdays, which is especially cruel when you know that your family and friends are probably sitting down to Thanksgiving dinner as you learn about soil types. However, as it turns out, non-Americans don’t know when Thanksgiving is supposed to be, so if all but two of your Thanksgiving guests don’t care that you are celebrating it on a Sunday, you just might be able to get away with it! So that’s what we did! The Sunday after Thanksgiving, which as you may recall was actually the first Sunday of Advent, which could take away Thanksgiving’s spotlight if you let it, we had an amazing Thanksgiving feast. For most of those in attendance it was their FIRST Thanksgiving! So that was pretty cool. 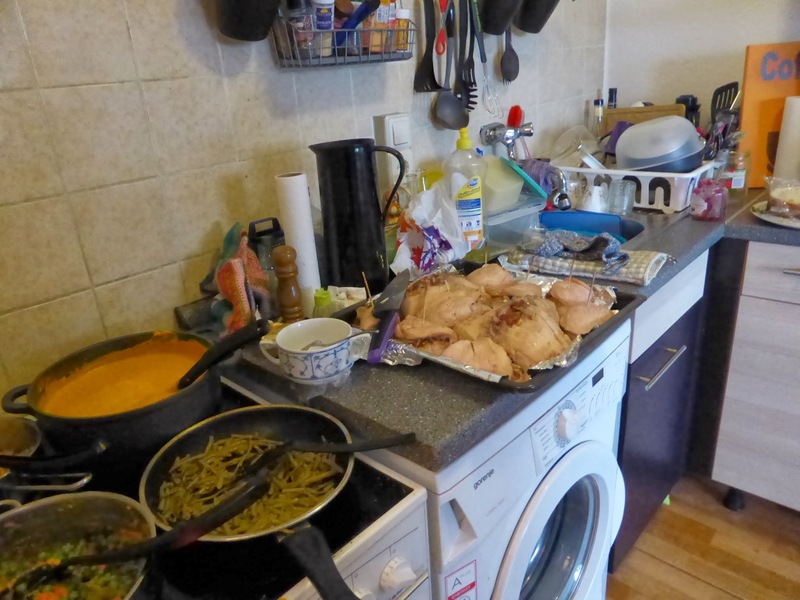 Felicitas and I planned out the menu by deciding to cook the Thanksgiving non-negotiables ourselves and then ask everyone else to bring the side dishes. So I bought a bunch of turkey (I was not about to attempt my first ever real Thanksgiving turkey this year, so I bought some turkey breasts and turkey cutlets), Felicitas found cranberries for cranberry sauce and cranberry pie, as well as pumpkins for pumpkin soup and pumpkin cake, and I tried in vain to make gravy (it was disgusting and I did not serve it). We also made some improvisational vegetables to round out the meal. Our guests brought salad, rice, sweet potatoes, dessert, and so much beer and wine! The person who had volunteered to bring potatoes had to cancel at the last minute, and since it was Sunday, we had a short panic that we wouldn’t be able to get our hands on any. But luckily a 365-day Lidl just opened at the train station and our wonderful British friend Nathaniel didn’t mind boiling them up for us! So we did have potatoes and all was well in the world. Even better than the food was the company. In addition to we two Americans, we had one Brit, one Hungarian, one Nigerian, and lots of Germans. 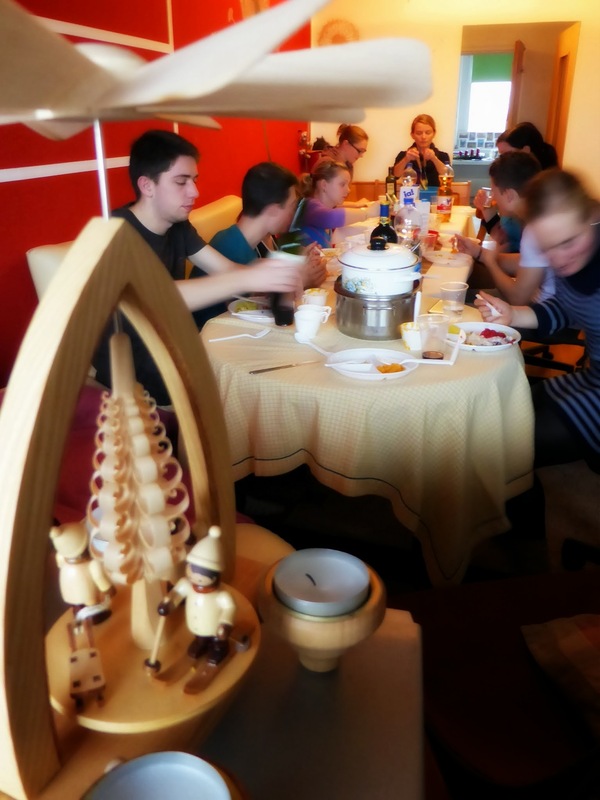 Two of my friends have been au pairs in the US before, so they’d celebrated Thanksgiving at least once, but we answered lots of questions from inquiring minds wanting to know how we REALLY celebrate Thanksgiving in the States, why football is so important to the holiday (try coming up with an answer to that one…), and the origin of Thanksgiving. Like any good Thanksgiving celebration, we ate way too much, and then we waited awhile and we ate way too much dessert, and we talked and enjoyed each other’s company. This was the first time I’ve ever had to do dishes from Thanksgiving dinner and I’d just like to say “thank you!” to my mother and all the other wonderful people who normally DO have to clean up after the Turkey Day carnage. It’s 5 days later and I just finished washing everything. 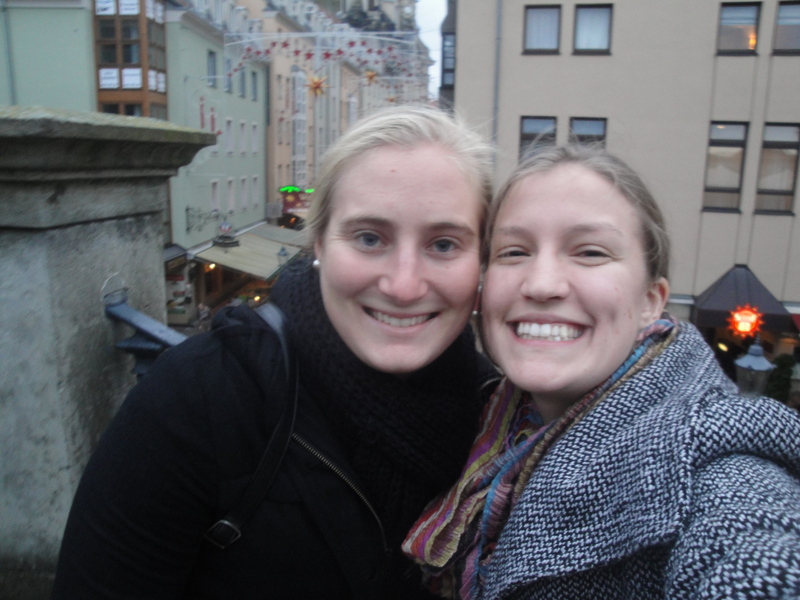 Felicitas and I are actually going to be celebrating Thanksgiving again tomorrow in Jena with Allie, who studied at Northwestern with Flitzi. But thankfully I won’t be the one cooking the turkey! We will, however, be making cranberry relish…. Flitzi bought six cartons of cranberries from Karstadt yesterday in anticipation! It’s been a really hard week. At the beginning of this week, I was just feeling lethargic, scattered, and down in a lot of different ways… I’ve been a little sick, so that sucked, I’ve been really tired lately (I have been embracing the German tradition of midday “Kaffee trinken” the past few days), I was feeling very behind on my research, and I was even starting to get a little bit homesick. It was not good. Luckily, I am feeling a bit better now, thanks to a few days of productive research and starting to actually, maybe, know what I’m doing. But something I’ve started doing in the past few weeks is going into the Altstadt on Thursdays. I have 3 classes on Thursday, which is the most I have all week (actually, I only have class on Wednesday and Thursday…), and I have a break between 2:30 and 6:30, so I normally go into the city during that time. As my research starts to pick up, maybe I’ll need that block to get work done, but it’s actually been a good morale booster. One week I used this time to go to the Grünes Gewolbe, an exhibit at the palace museum, and then got some ice cream; one week I went to the big department store and bought my winter boots; there’s actually adoration at the cathedral from 5-6 on Thursdays so I did that one week. This week and last, I used this time to meet up with my American friend Felicitas! Last week we got coffee and pastries together, and this week we got coffee and pastries and then went shopping at TK Maxx (aka what they call TJ Maxx in Europe). It’s gotten REALLY COLD here all of a sudden, and it’s going to get EVEN COLDER in the next few months, and I was in dire need of some heavier sweaters than what I could find in Texas in the summer… Good news, I found some! Hopefully in the coming Thursdays I can see some more museum exhibits, since I have a year pass and have only gone once (terrible! ), go to Adoration more frequently, and see more of the city. I know it’s ridiculous to feel so worn out, since I only have class on two days, but I actually need more motivation to spend my work time actually working… and what better motivation than to really enjoy my free time? My motivations for this week include: a weekend in Struppen with people from the KSG (German equivalent of the UCC), a double feature of the Hunger Games on Wednesday (which is a holiday! ), and finally getting interested in my research! It’s finally beginning, and even though I feel kind of behind and overwhelmed, I’m excited about my project! I suppose it’s good to feel challenged! 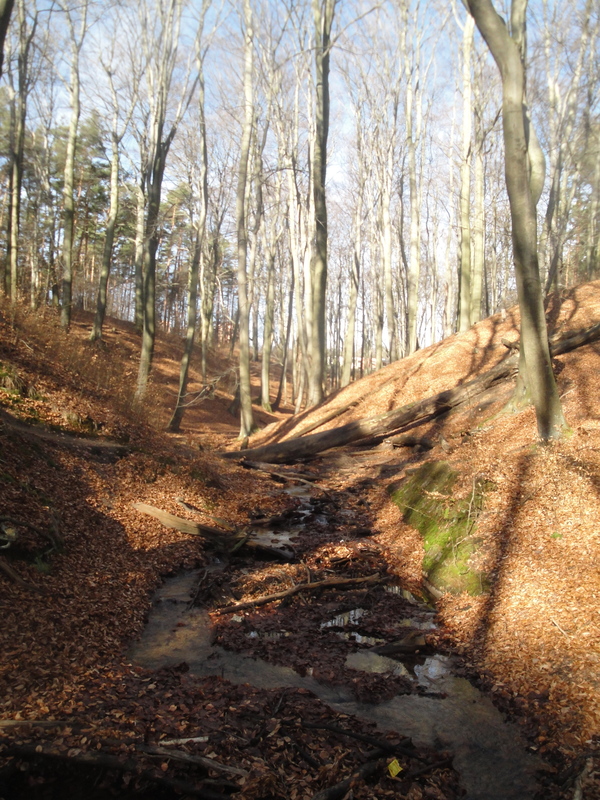 We had Thursday off for Reformation Day (yay for eastern Germany…), and since I don’t have class on Fridays or Mondays (yay for being done with my degree already), I decided that this would be my chance for once nice, long trip to somewhere of my choosing. Thursday: To skip over some ridiculous hurdles I encountered during the planning process, I arrived in London on Wednesday around midnight. My hostel for that first night was, just by chance, right in the middle of the action… only a 15 minute walk (not counting getting lost, of course) from Westminster Abbey. Bright and early, I grabbed a trusty tourist map from the hostel and headed out to see the sights on my own before catching a free walking tour at 11. 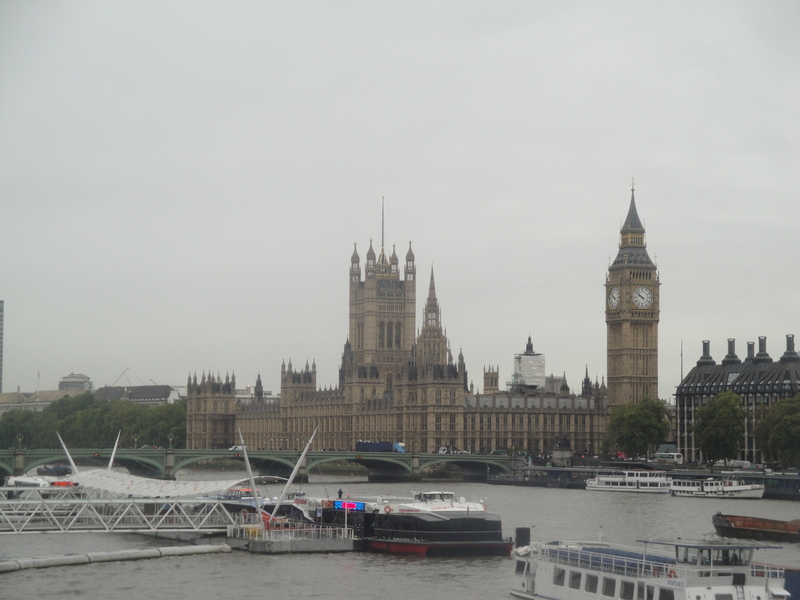 I saw Westminster Abbey (from the outside only), cruised past the Houses of Parliament and Big Ben (which I’ll admit was not quite as big as I had expected), walked across the Waterloo Bridge to see the London Eye from up close before heading back across the Thames to the Whitehall neighborhood near Charing Cross. 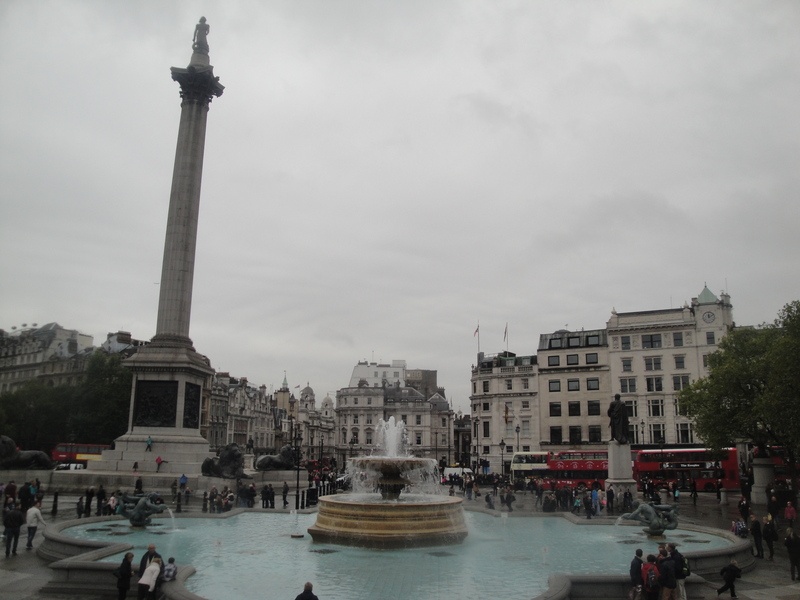 Then I (eventually, after getting a little turned around) walked to Trafalgar Square, which is the first place I really realized, “Whoa! I’m in London!” Why that didn’t occur to me while looking at Big Ben or literally gazing out over the Thames, I’m not sure, but Trafalgar Square is bustling with double-decker buses, you’re surrounded by huge, impressive buildings and statues (and currently one ridiculous blue chicken), and in the rush of all the activity, I could hardly believe I was actually there! 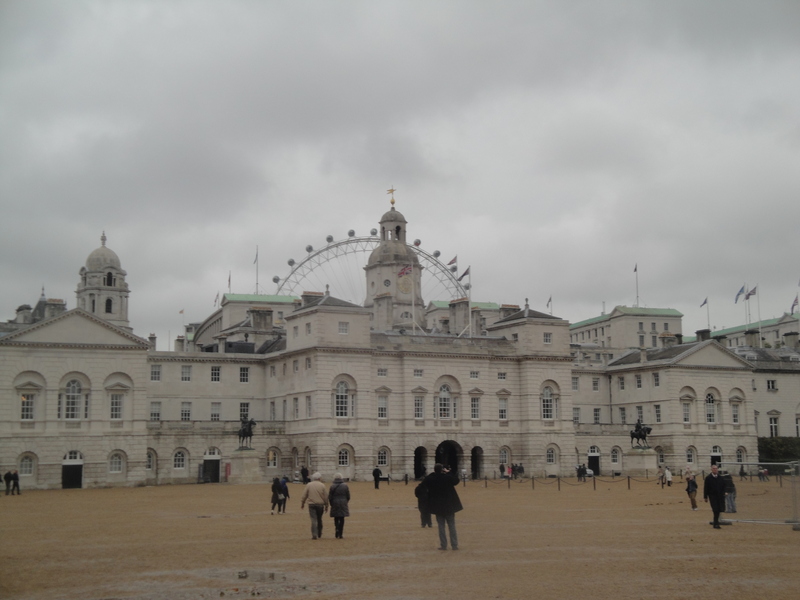 Horse Guards Parade, aka the site of the 2012 Olympics Beach Volleyball! I don’t know why that fact blew my mind more than anything haha. After the tour, a group of us grabbed lunch at a pub. It was really interesting hearing about everyone else’s travels… what brought them to London, where they’ve been before, where they’re going next. 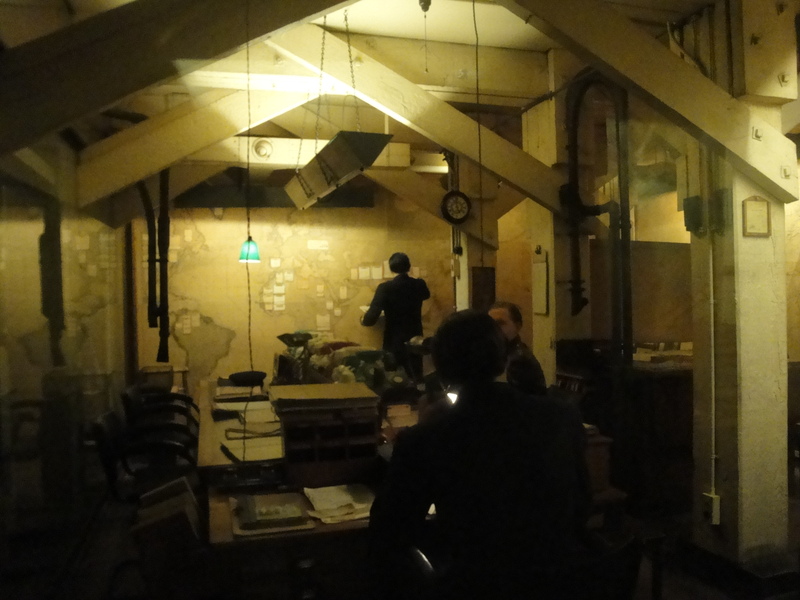 My next stop was the Churchill War Rooms, an underground exhibit in a bunker near the Houses of Parliament where Winston Churchill and his War Cabinet would work and (mostly) live during the Battle of London and the rest of the war. Despite all the other (free) museums, I really, really wanted to see this one, and it did not disappoint. It was incredible to see the rooms from which Winston Churchill commanded the progress of the war–and many of them were in their original condition, as in at the end of the war, the workers turned off the lights, locked the door, and left, and then it got turned into a museum. As an amateur WWII buff, it was absolutely fascinating to see the maritime maps, the BBC radio broadcast center, the scrambled phone from which Churchill could directly call Roosevelt or Truman, the Churchills’ private dining room… it was just awesome. Friday: After my absolutely delightful first day, I worked hard to put together a perfect plan for Day 2. I wanted to see the East End, as I’d spent the previous day all on the west side. Because I’d bought the East End Tour ticket, I figured I’d take the tour at 11 and then spend the rest of the day at some other East End sites: the Tower of London, St. Paul’s Cathedral, the Globe Theater, maybe check out some of the markets… and of course because this was November 1, aka All Saints Day, I would start by going to Mass. So I found a Mass scheduled for 9:30 right near Tower Hill. However, my first experience with London public transit was not smooth sailing. I got on my first bus headed the wrong direction, and then because the hostel WiFi had stopped working on my phone (since I wasn’t in the hostel anymore, obviously), I didn’t really have a contingency plan. 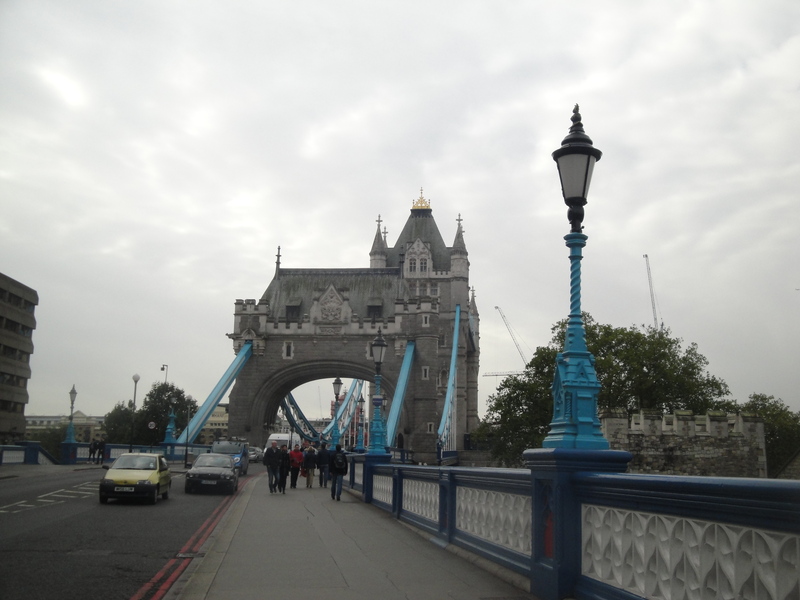 So I saw a bus going to London Bridge and hopped on it. After about an hour (the buses stop approximately every 3 seconds), I wasn’t even halfway to London Bridge, which was not even my eventual destination. So the first chance I got to disembark and hop on the Tube, I took it. 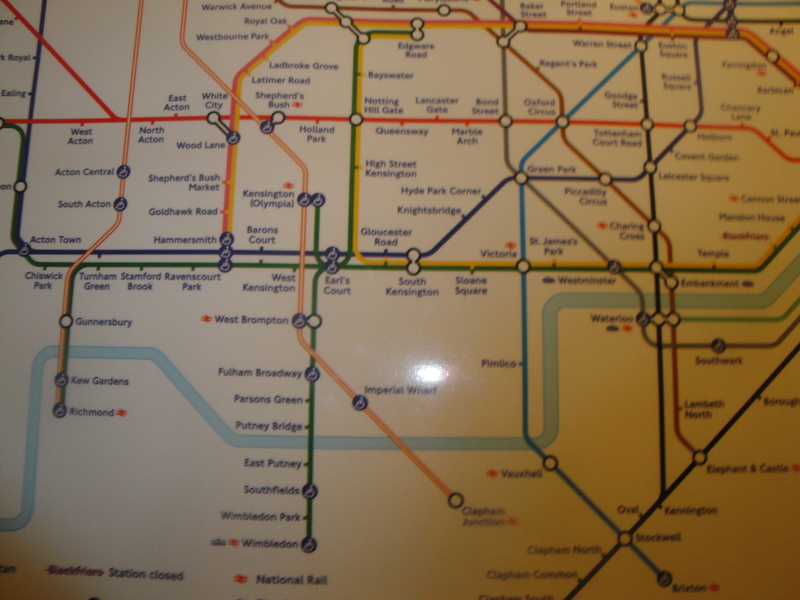 The Tube is wonderful, but why must it be so expensive?? However, the alternative is the bus… it took about an hour to get from Clapham Junction to Elephant & Castle. Gag. At this point, I had 10 minutes before Mass was supposed to start. So I got on the Northern line and then changed to the District line, sprinted to the church, got there at 9:39, decided that it was worth it to still go, and then realized that the church was totally empty. Apparently because the parish school was on holiday, they only had masses at 12 and 1. 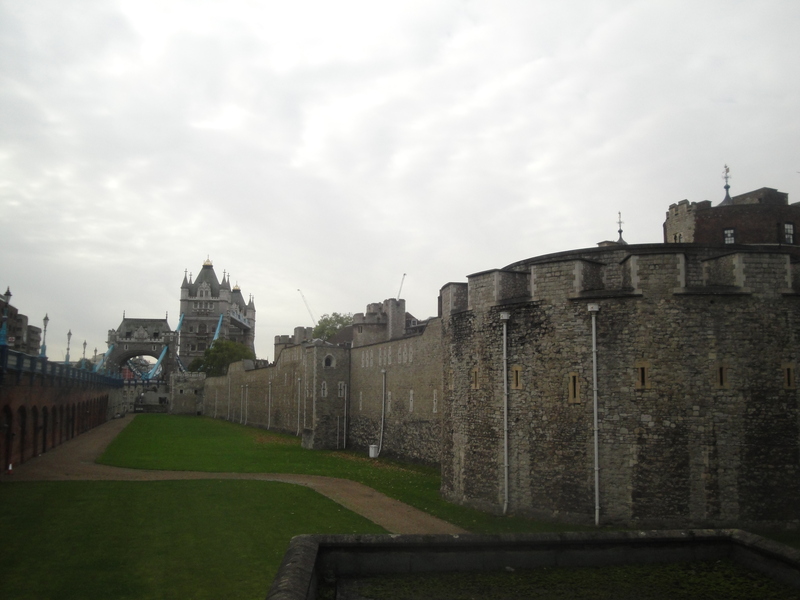 So I made the snap decision to skip the tour (my ticket wasn’t bound to a particular day, so I could always go Saturday or Sunday) and spend a few hours at the nearby Tower of London until Mass. 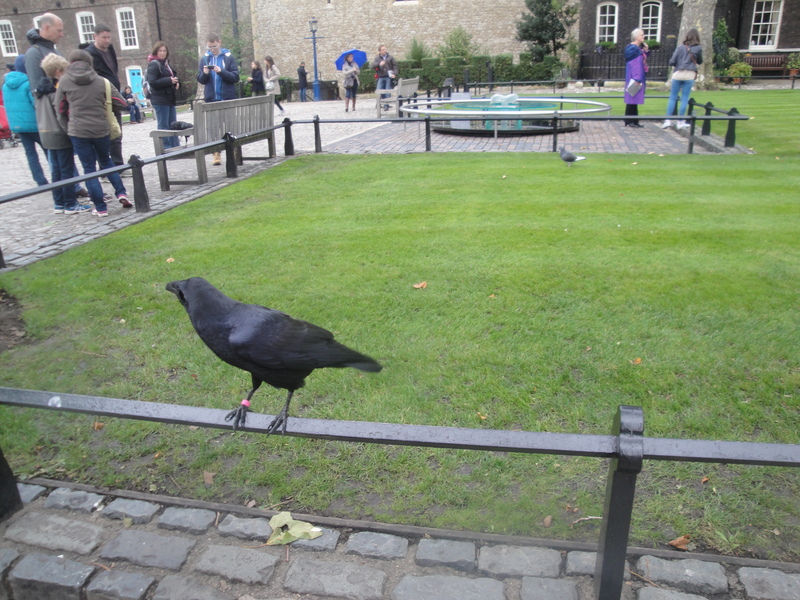 The Tower of London was my one big splurge for the week. 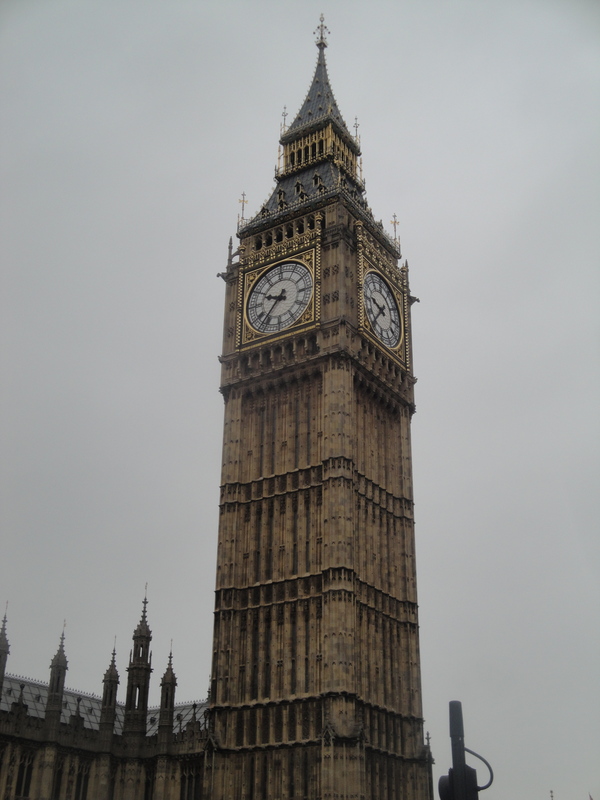 It cost 18 pounds, but I knew I’d regret it if I came all the way to London and didn’t even see the Tower. Because, you see, as much as I am a WWII buff, I am probably an even bigger Tudor England enthusiast. 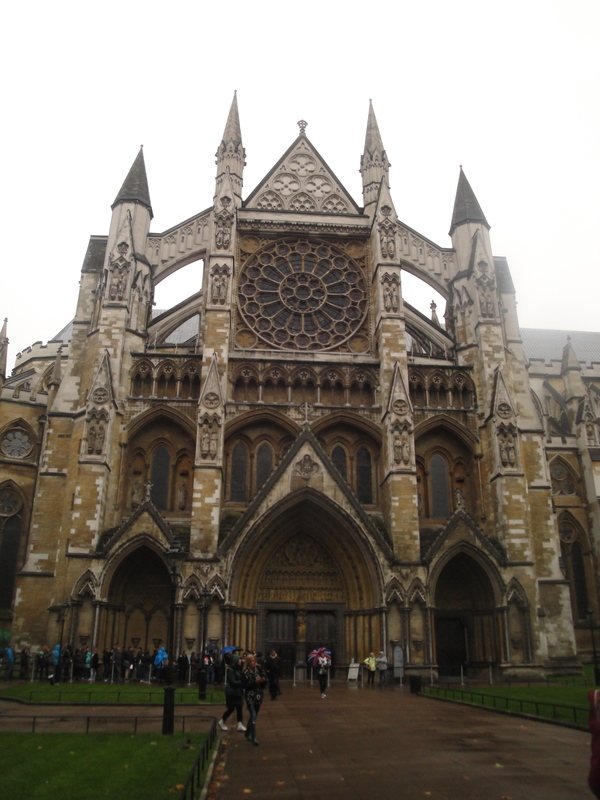 I have read countless books about Elizabeth I, Anne Boleyn and King Henry’s other wives, and even though the Tower is kind of a gruesome place, it was totally cool to actually BE there. 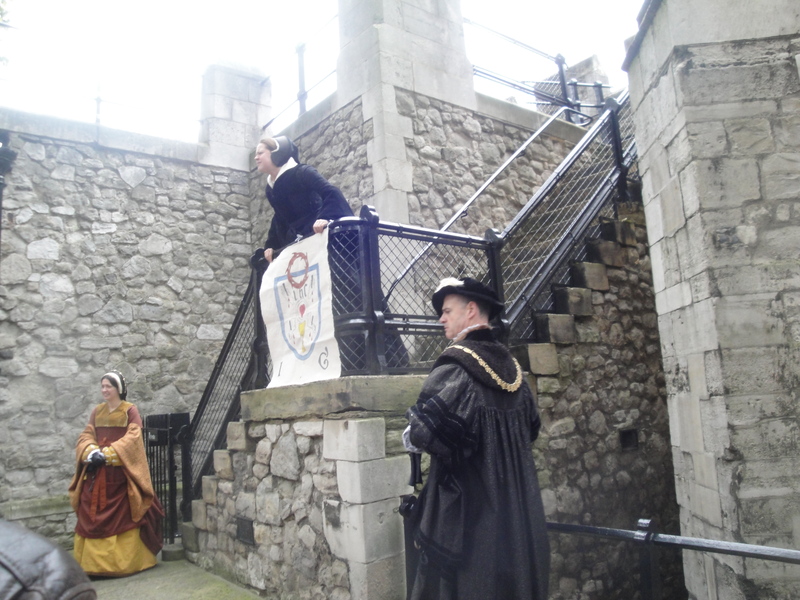 I went on a tour guided by one of the yeomen who lives at and takes care of the Tower, and once again was glad to hear the history behind the places I was seeing. There have been some very famous prisoners at the tower… Sir Walter Raleigh, who is even more hated in England for his introduction of line dancing from the States than he is for bringing tobacco here; William Penn, who was released from imprisonment on the condition that he leave England, which he did and shortly founded Pennsylvania; Rudolf Hess, the deputy leader of Nazi Germany; and of course Anne Boleyn, Jane Boleyn, Katherine Howard, and even future-Queen Elizabeth herself! 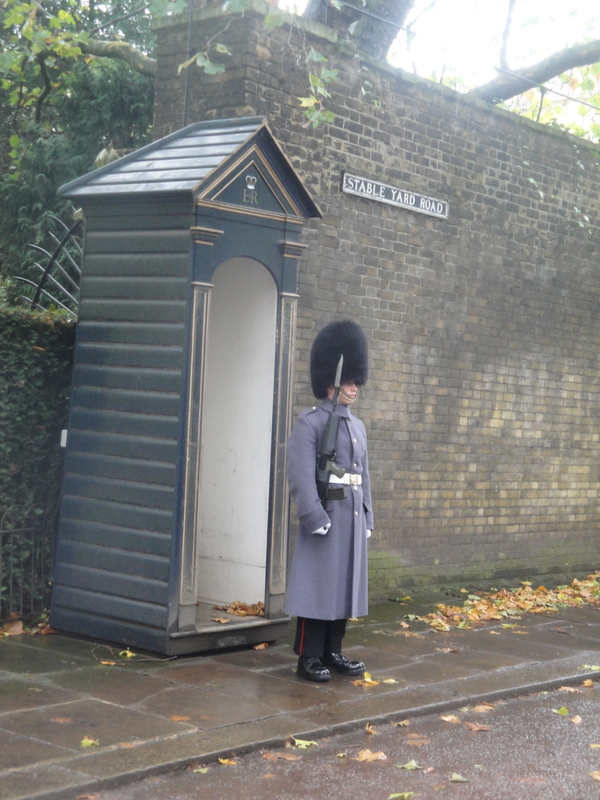 And, not to mention, the Tower is now the home of the Crown Jewels. I couldn’t take a picture of them, of course, but you can imagine that there was some intense diamond action going on in there. During my post-Mass Wifi sesh at Starbucks (seriously, God bless Starbucks for their free Wifi on every corner! ), I finally got a response from my friend Joey saying that he was free to meet up later that evening after his lab! We decided to meet at the British Museum, so in the meantime, I headed back to the West End. The restaurant was right across the street from the Natural History Museum and the Victoria & Albert Museum. I chose the latter and treated myself to a few hours of (free) museum time learning about Britain from 1600-1900. I always immediately regret committing large chunks of time to a museum, because inevitably, my feet will start hurting and my main objective will become trying to find a bench to sit on instead of actually enjoying the museum. However, I never learn my lesson. But at least this museum was free! Then, I made the near-fatal decision to get on the tube at 5:15, which I can only assume is actually rush hour, and it was terrible. I did make it to the British Museum, though a little late, and immediately realized that it was a terrible choice of a meeting place for 2 people unable to contact each other via cell phone. It’s huge and there are people everywhere. However, after about 15 minutes of frantic searching and trying to borrow someone’s phone, I finally found Joey! A bit about Joey, in case my readership ever expands and people are curious. Joey is my brother’s age, a 3rd year at UT. I met him after he went on Longhorn Awakening his freshman year, but actually the first thing I knew about him was that he had a class with my brother! Small world. Joey is a Plan II major, so he is currently holding down the Plan II/Catholic fort after all of us graduated last year. Except he’s in England now. In any case, he is a rockstar Biochemistry/Pre-Med kinda guy, which means he knows way more science than me and he has to do things like go to labs on Friday afternoon. After we finally connected, we got to spend the weekend doing fun London-y things, gossiping about our mutual friends (I mean, what? ), and being our sassy selves. Since I knew I had quite the trek to make back to my hostel, the night ended there, but not before we made plans to go to High Tea together the next day! To be continued, since you’re a rockstar if you’ve even made it this far!